SAN Volumes LUN same ID recommended? Is it recommended, that all CSVs have the same LUN ID on each Hyper-V host? Or is it Ok, if LUN 1 has LUN ID 0 on Cluster host 1 and LUN ID 4 on cluster host 2? How to check if the Guest VM is quiesced? How to check if a third party application is sending a quiesce and snapshot/checkpoint request to Hyper-V? What are the events logged when the checkpoint and reference points are created? merge start and complete Events (19070&19080) are logged. nothing for quiesce operation start. How to enable virtualization in Windows Server 2019 running on Hyper-V 2012 R2 Datacenter. 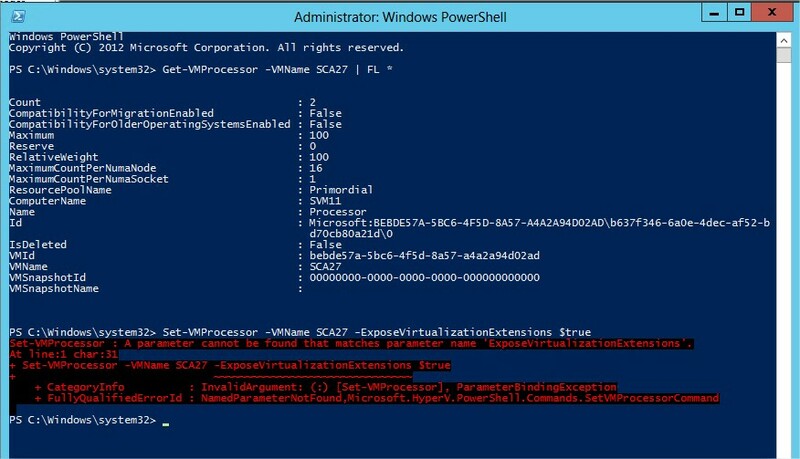 I’m having trouble activating virtualization features in Hyper-V 2012 Datacenter to virtualize within Windows server 2019. How to enable virtualization in Windows Server 2019 running on Hyper-V 2012 R2 Datacenter? I need to install Docker on the virtual machine with Windows Server 2019 that is running Hyper-V 2012 R2. I have performed the command below and I do not receive the information that it is not available for activation. I apologize in advance for my ignorance with regards to Windows Licensing. Windows 2016 Standard should provide 2 virtualization rights, this VM is shown as "not activated". From what I’ve read we should use AVMA, but that’s only available in the Datacenter Edition AFAIK. Some topics suggest we use the same key used by the Host, but apparently that doesn’t work between distinct Windows Server releases (2016 vs 2012). I’ve seen some topics suggesting I have to order a "license downgrade" or something. Does that mean I should contact OVH (from whom I bought the license) and request a Windows 2012R2 Standard license for this Hyper-V VM? This is go into production tomorrow, so please let me know how we can sort this out as soon as possible. The post Inventory View, Solution Identification and Ability to Mute Findings Now Available In Skyline appeared first on VMware Support Insider. I have tried inserting the setup disk and running setup.exe /uninstall however this shows the same message. and sometimes when it reboots it doesn’t autostart all of the machines it is supposed to. I’m planning an Active Directory Domain rename. We have also a cluster with Hyper-V 2016, I’ve tried to search about this operation but somewhere it seems that’s supportted and somewhere they says that’s not supported and I need to rebuild the cluster. Has anyone some experience with this? what is the correct path? Recently one of my colleagues created a checkpoint for one of our VMs thats in production. This particular VM hosts the SQL server. Now everytime the back-ups run it creates a new sub-checkpoint for the temporary VM. all the checkpoints and associated data since the .vhd has been used more recently than the first checkpoint? Or will it merge the checkpoints with .vhd anyway? bad idea and addressed it with the person who created it already. Ideally I would like to just delete this checkpoint tree have it merge with .vhd file and disable the ability to create them in the future. Let me know if you need more info! I´m connected to TS/RDP to Node-A and if i try to create a new VM it succeeds!